By Just Harvest on March 22, 2017 in Blog, Take Action! 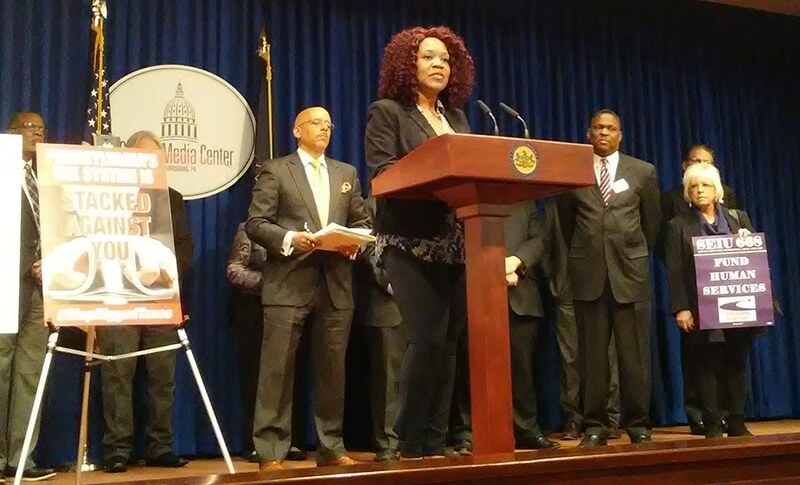 Our public policy advocate, Rochelle Jackson, joined the Pennsylvania Budget and Policy Center, Power, and Conservation Voters of PA to release a new state revenue proposal today. The Fair Share Tax would help struggling Pennsylvanians by fully funding human services and making sure our commonwealth is a place of thriving communities and individual opportunity. It would raise $2 billion annually, while cutting taxes or leaving them level for 85% of Pennsylvanians. The Fair Share Tax plan would increase funding for protection of our air and water and allow the state to equitably fund public education. Senators Vince Hughes and Art Haywood introduced it as a bill in the Pennsylvania Senate today (SB 555). Other members of the Pennsylvania’s Choice coalition, including various labor unions and the PA Council of Churches, were also in attendance today. 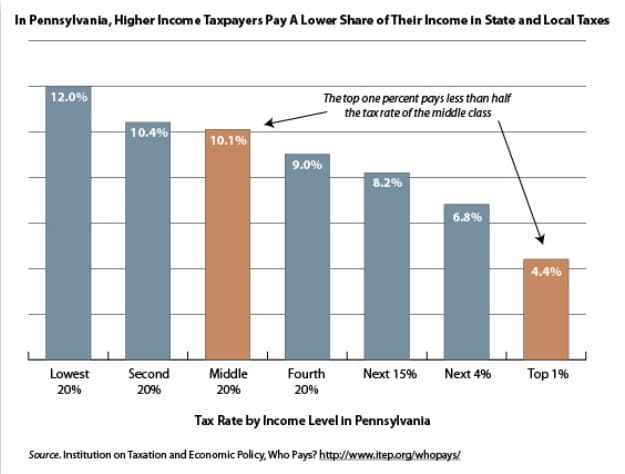 From the Pennsylvania Budget and Policy Center’s Fair Share Tax report. Cuts the tax rate on wages and interest (which almost all taxpayers have), but raises the rate on other forms of income (like dividends, capital gains, and business profits) that mostly go to the rich. Would raise $2 billion annually, while lowering taxes for 58.3% of taxpayers, with no increase for 26.2% of taxpayers. Brings in needed revenue, 50% of which comes from the top 1% of taxpayers, 72% comes from the top 5% of taxpayers, and 88% comes from the top 20% of taxpayers. “One argument we hear often is how Pennsylvania is overtaxed. That is far from true. 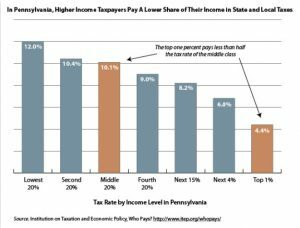 For example, even after implementation of the Fair Share Tax, the effective rate on the top 1% of Pennsylvania taxpayers will still be 3.6%, less than that of any neighboring state and only 45% of the rate found in New York and New Jersey,” said Marc Stier, director of the nonpartisan Pennsylvania Budget and Policy Center, which is leading the campaign to pass this plan. fair taxes, Pennsylvania, state government, Take Action!